The FY 2007 audit rate for the nation's largest corporations has plunged to its lowest level in the last 20 years, less than half what it was in FY 1988, according to IRS data analyzed by the Transactional Records Access Clearinghouse (TRAC). 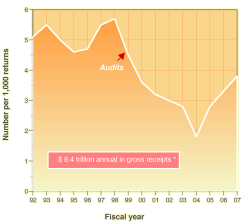 The historic collapse in audits for the corporations with $250 million or more in assets was especially notable during the last two years when the rate dropped from 43% in FY 2005, to 34% in FY 2006 and then to an all-time low of 26% in FY 2007. See Figure 1. But along with the declining number of audits for the largest corporations, the IRS data point to a second significant finding: the thoroughness of these essential audits has been dropping. One example of this broad problem can be seen by the fact that the typical amount of time auditors spend on each of the large corporate audits is down by 20 percent over the last five years (see table). The IRS has also cut back on the so called "Coordinated Industry Case" audits it conducts. These are the in-depth examinations the agency reserves for the largest of the large corporations. Over the last five years, the number of CIC cases has dropped by one third (33%), from 528 to 353. See Table 1. The potential impact of all of these shifts for the nation as a whole is considerable. In FY 2007, for example, the audits of the giants were responsible for the majority of the recommended additional taxes that taxpayers of all kinds were asked to pay. In concrete terms, the additional taxes the auditors said the large corporations owed came to $24 billion or 54% of the total. From the perspective of the large corporations, however, the benefits were clear. Focusing only on the last few years, for example, the number of field audits and auditor hours aimed at the large corporations declined by 30% and the total of additional taxes these entities were found to owe the government was down by 20%. See Table 2. Worried about the current downturn in the nation's financial system and the recent dramatic collapse of Bear Sterns, the Bush Administration and Congress are now debating a number of different plans to improve federal oversight of the economy, particularly of the financial markets. Published reports, however, so far have not indicated that ramping up IRS audits for the largest corporations is one of the options under consideration. The IRS did not respond to queries about key aspects of this report. The dramatic slump in the audits of the large corporations has occurred at the same time that the IRS has assured Congress and the public that audits for all corporations have been increasing. Analysis of the IRS's data shows that the explanation for this apparent contradiction lies in the changing enforcement strategies adopted by the agency. By ordering its revenue agents to concentrate on the smaller corporations that normally take a lot less time to audit, the agency was able to push up the overall number of corporate audits while the examination of the larger entities was sharply declining. This means that while the FY 2005 to FY 2007 audit rates for the smaller corporations were climbing — particularly for those with $50 million or less in assets — the rates for the corporations with assets of $50 million or more were falling. See Figure 2 and Table 3. The apparent effort by the officials heading the agency's Large and Mid-Size Business (LMSB) Division to pump up the number of audits had an even more perverse result on audit rates. Normally, the odds of audit rise as corporate size increases. This can be seen in both the Small Business and Self-Employed (SBSE) Division and the larger categories of LMSB. 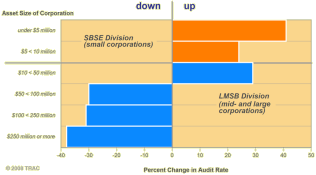 The expansion of audits for the LMSB's "smallest" class of corporations (with $10-$50 million assets) raised the audit rate to 14.7 percent — significantly higher than either the 10.9 or 11.5 percent audit rates for larger firms in each of the next two higher asset brackets. See Table 3. But there was a major cost involved in the IRS's effort to drive the overall corporate audit rate higher. This is because although the audits of the smaller corporations take a lot less time to complete, they also produce far less revenue for the government. For example, in FY 2007, for each revenue agent hour spent auditing the smallest corporations, the government uncovered $682 in additional recommended taxes. And, for mid-size corporations whose audit rates increased so fast that they surpassed the rates for the larger corporations, each hour of revenue agent's time resulted in even less money, only $474 in recommended additional taxes. At the other extreme, however, for every hour that the IRS devoted to auditing the corporations with more than $250 million in assets, the revenue agents recommended $7,498 in additional taxes. See Figure 3 and Table 3. Do you think the public should be barred from future access to audit statistics used in this report? This is IRS's view. And on March 3 the agency filed suit against TRAC's co-director, Susan Long, seeking a court order to achieve that purpose. The bottom line: moving the focus of the corporate auditors away from the large corporations and towards the smaller ones has been quite effective when it came to increasing the overall number of these kinds of audits but actually was counter productive in financial terms. In years past, one important but simple way the IRS sought to measure the effectiveness of its revenue agents and the ability of the agency to correctly target non-compliant corporations was to track the hours devoted to what it classified as either a "productive" or a "non-productive" audit. A productive audit was one where in the end the IRS had sought a change in the subject's recommended taxes. A non-productive audit was one where no change was recommended. By this measure, audits of the smaller and midsize corporations are surprisingly non-productive. Just considering this group of corporations, about one third of all revenue agent time resulted in absolutely no changes in recommended taxes that were owed. See Table 4. The very large proportion of failed audits strongly suggest that IRS has a long way to go when it comes to improving its ability to target the corporations most in need of examination. Alternatively, it could also mean that because of the agency's decision to limit the scope of its audits, the IRS is missing some of the key issues on which tax under-reporting is occurring. Whether it is the poor targeting of the corporations that most need an audit or the ineffective identification of the questionable corporate practices, the evidence is clear that the IRS efforts to improve compliance among the smaller corporations is far from impressive. Yet it this very group of corporations where the IRS has chosen to ramp up its audits. TRAC's report on the IRS last year focused on the finding that in FY 2006 revenue agents spent more of their time on corporate audits that produced no revenue than they had in the recent past. Thus, from FY 2001 to FY 2006, while productive hours had not increased at all, non-productive hours had grown 40 percent. See earlier TRAC report. The latest data show that this failure has continued in FY 2007: 437,262 nonproductive audits hours in FY 2001, 611,590 in FY 2006 and 688,492 in FY 2007. While productive hours between FY 2001 and FY 2007 had dropped by 11%, nonproductive hours had continued to rise, up by 57%. TRAC's 2008 report does not examine IRS efforts to audit individual taxpayers. This is because, as described in "About the Data," the IRS has ignored federal court orders obtained by TRAC's co-director Susan Long requiring the release of AIMS data on IRS audits. These latest trends were driven by the sharp jump in non-productive time generated during the audits of the largest corporations. It increased by 24% between FY 2006 and 2007. This jump was particularly surprising since, as noted above, total revenue agent hours spent auditing the largest corporations had fallen sharply during the same two years. Indeed "productive hours" spent on the largest corporations last year tumbled 19 percent. See Figure 4 and supporting table. While it is unquestioned that the vast majority of time spent auditing the largest corporations results in recommended tax changes, it is still surprising that at a time of resource cutbacks why non-productive hours continue to grow seemingly unchecked. For the last few years, IRS officials and others have emphasized the importance of properly policing financial entities in addition to the traditional corporations. In a recent press release, for example, the agency suggested that its "continued efforts to review more returns of the flow-through-entities — partnerships and S Corporations" — represented a partial substitute for the declining number of the large corporation audits. And indeed, while the FY 2007 audit rate for these areas — 3.8 per thousand returns — was higher than the all-time low of 1.8 per thousand in FY 2004 — the most recent rate also is substantially below what it was during all of the nineties. See Figure 5 and supporting table. The widespread concern about the level of compliance among these other entities is viewed as valid by almost all tax experts. But the government's current effort to deal with this problem must be kept in perspective. * One staff year = 2000 audit hours; audit hours = number of audits x average audit length. Note audit length assumed the same for 2006 and 2007. Here are the facts. In FY 2005, IRS's Large and Midsize Business Division devoted a total of 2,763 audit "staff years" to auditing corporations. Between FY 2005 and FY 2007, shifts in the audit force for examining partnership and S-corporation returns were relatively minor, with the number of "staff years" increasing by an estimated 32 for partnerships and 45 for S-corporations. Together this is less than 3 percent of the number of staff years focused on all LMSB corporate audits in FY 2005. See Table 5. Thus the huge drop in large corporate audits, especially in the last few years, cannot be fully explained by the relatively modest diversion of enforcement resources to the pass-through entities. That argument is further weakened by the fact that the Bush Administration and Congress in the FY 2005 to 2007 period increased the total number of revenue agents by 664. See Table 6. And the argument that any diversion would have been at the expense of the audits of the largest corporations also ignores the fact that the Large and Mid-Size Business Division charged with auditing the largest corporations also found revenue agent time available to added 113 additional staff years during the FY 2005 to 2007 period to boost audit rates for the smaller corporations it handles. As discussed above, this transfer of revenue agent hours raised audit rates for this corporate class having $10 to $50 million in assets above those for all but the largest corporations for very little revenue gain.